Last modified on February 15th, 2018. 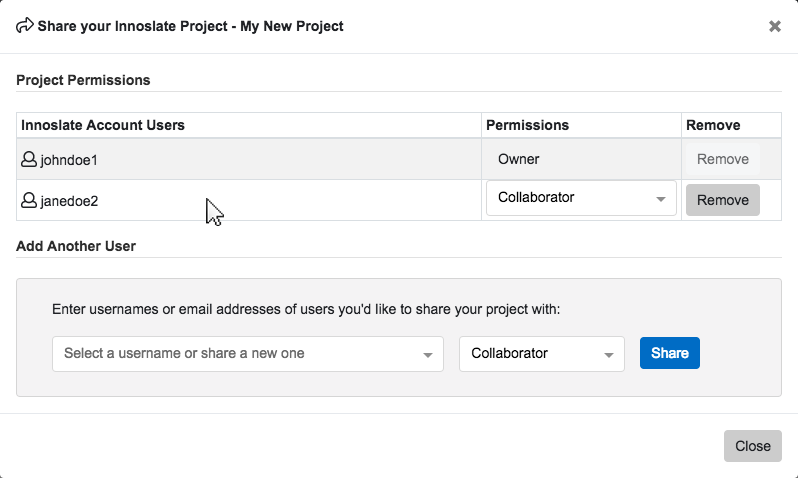 Sharing a project gives another Innoslate user of your choice access to your project with a certain level of permissions. This facilitates collaboration by allowing a single project to be shared with your teammates. Open the project you wish to share and click the 'Share' icon in the top navigation bar. This will open the 'Share your Innoslate Project' dialog. Here, you can 'Add Another User' by typing in the username or email address of the Innoslate user with whom you wish to share your project. 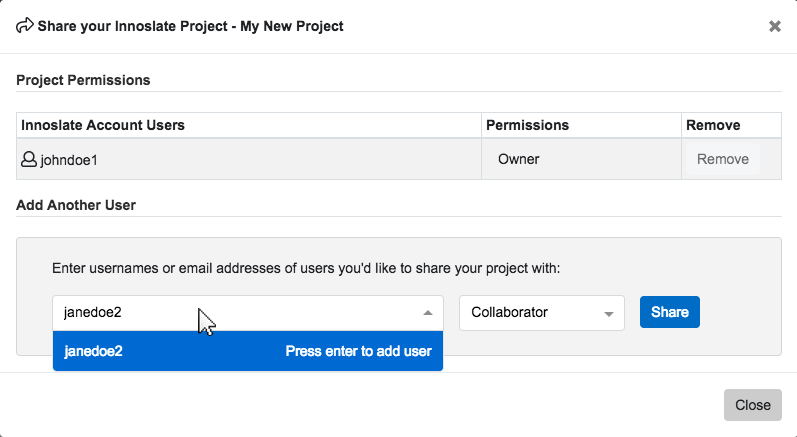 Press 'Enter' on your keyboard to add the username/email to the list of available users with whom you can share a project. Using the same drop-down box, you can now select the user(s) from the list with whom you wish to share your project. 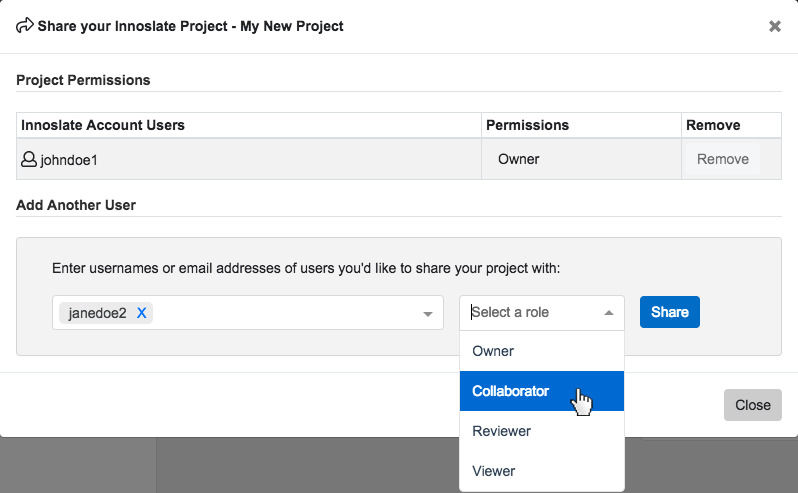 Next, using the second drop-down menu, select which project-level permissions (Owner, Collaborator, Reviewer, Viewer) you wish the grant the selected user. You will now see that user added to the list of 'Innoslate Account Users' under 'Project Permissions' in the dialog box. 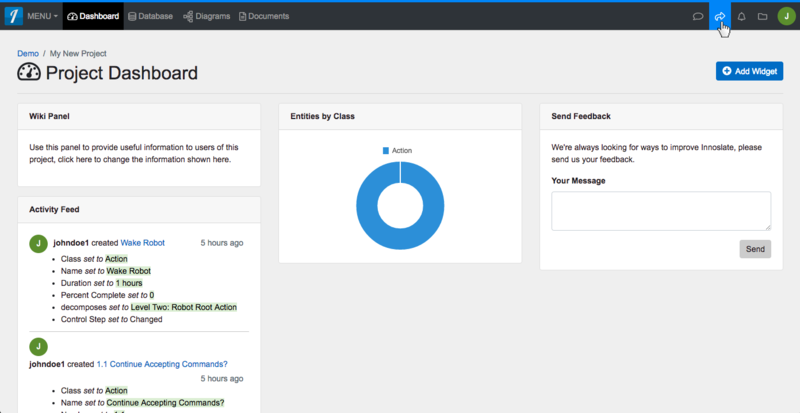 In addition, that other user will be sent an email notifying them that you have shared a project with them in Innoslate. When you are finished, click the 'Close' button to exit the dialog. 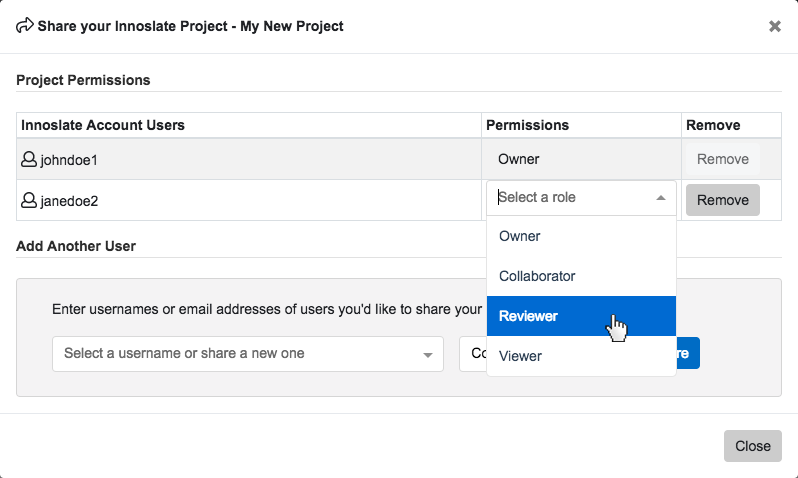 If you wish to unshare a project from a user you previously have shared with, you can edit or remove their project-level permissions. Open the project that is currently being shared and click the 'Share' icon in the top navigation bar. This will open the 'Share your Innoslate Project' dialog. You should see a list of 'Innoslate Account Users' that currently have access to your project. You can change the level of permissions granted to that user by using the drop-down menu under the 'Permissions' column to the right of that user's name. You can also unshare your project from a user completely, by selecting the 'Remove' button to the right of that user's name. When you are finished, click the 'Close' button to exit the dialog. Open the project you wish to share and click the ‘Share’ icon in the top navigation bar. This will open the ‘Share your Innoslate Project’ dialog. Here, you can ‘Add Another User’ by typing in the username or email address of the Innoslate user with whom you wish to share your project. 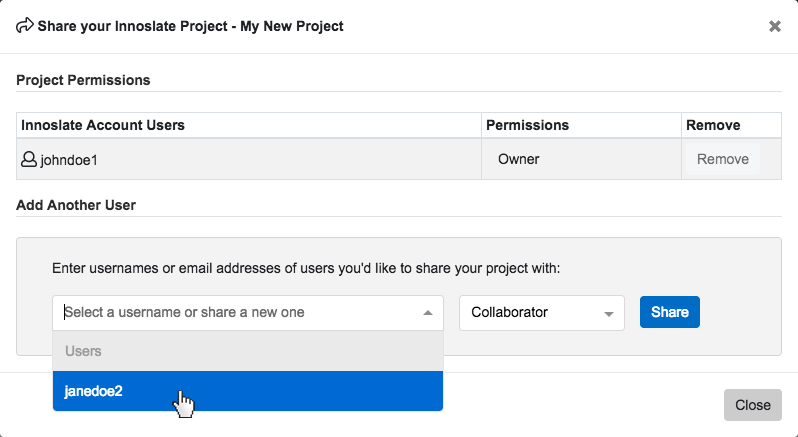 Press ‘Enter’ on your keyboard to add the username/email to the list of available users with whom you can share a project. You will now see that user added to the list of ‘Innoslate Account Users’ under ‘Project Permissions’ in the dialog box. 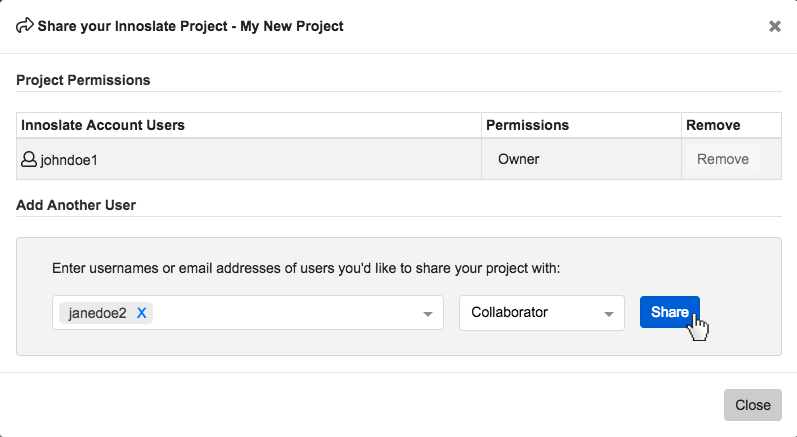 In addition, that other user will be sent an email notifying them that you have shared a project with them in Innoslate. When you are finished, click the ‘Close’ button to exit the dialog. Open the project that is currently being shared and click the ‘Share’ icon in the top navigation bar. This will open the ‘Share your Innoslate Project’ dialog. You should see a list of ‘Innoslate Account Users’ that currently have access to your project. You can change the level of permissions granted to that user by using the drop-down menu under the ‘Permissions’ column to the right of that user’s name. You can also unshare your project from a user completely, by selecting the ‘Remove’ button to the right of that user’s name. When you are finished, click the ‘Close’ button to exit the dialog.